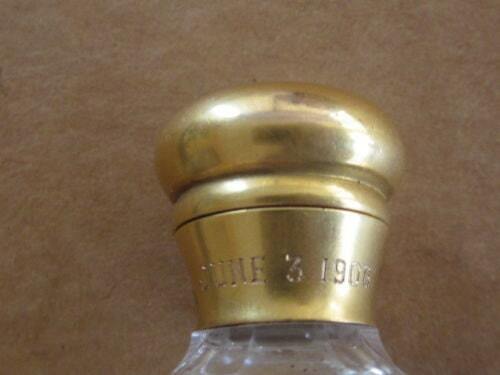 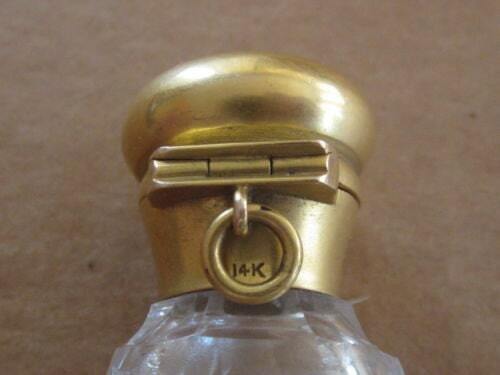 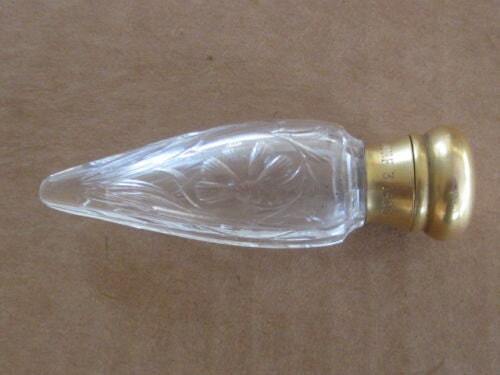 Fine Antique 14k Gold Cut Glass Scent Art Nouveau Perfume Bottle EX! 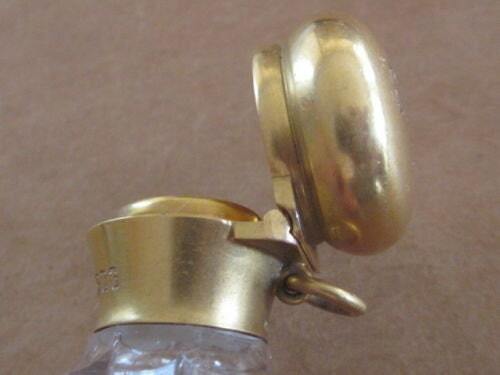 UP FOR AUCTION AND WITH NO RESERVE IS AN OUTSTANDING FINE QUALITY ART NOUVEAU CUT CRYSTAL WITH HEAVY 14K SOLID GOLD HINGED TOP AND NECK AND LOOP..THIS IS A CHATELAINE SCENT BOTTLE OF THE HIGHEST QUALITY..THE GLASS IS CUT WITH FINE ART NOUVEAU FLOWERS AND VINES ON THE FRONT AND BACK OF THE BOTTLE..THE SIDES ARE CUT WITH DEEP RIBBED PRISM TYPE CUTS..THE CONDITION IS EXCELLENT! 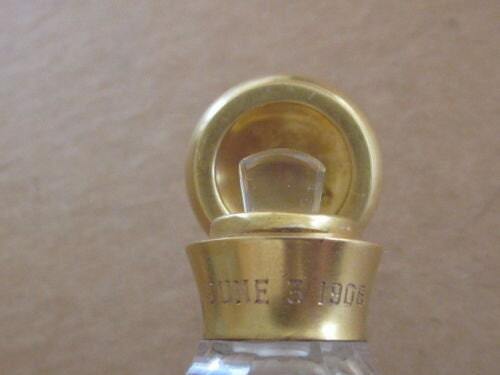 !THEIR ARE NO CHIPS...CRACKS...BREAKS OR REPAIRS AND THE GLASS IS CRYSTAL CLEAR WITH NO STAINING OR DISCOLORATION..THE GOLD IS PRISTINE AND IS VERY THICK AND HEAVY AND IS SOLID 14 KARAT GOLD WITH NO DAMAGE OR REPAIRS..IT IS DATED ON THE GOLD NECK JUNE 3 1906 AND HAS INITIALS ENGRAVED ON THE TOP AS SEEN IN MY PICTURE..THE BOTTLE MEASURES 3 1/8 INCHES LONG AND IS 1 INCH WIDE..THE BOTTLE EVEN HAS ITS ORIGINAL GLASS STOPPER AND IS ALSO IN PRISTINE CONDITION!THIS ITEM LOOKS MUCH NICER IN PERSON..IF YOU ARE LOOKING FOR A RARE AND VALUABLE CHATELAINE SCENT PERFUME BOTTLE TO ADD TO YOUR COLLECTION THEN DO NOT MISS OUT!THIS IS A EXCEPTIONAL ONE.